If you missed #38 click here. Best Moment: I always thought Devil was so badass back when this game came out. I mentioned in the entry for the first Tekken game (which got to #44, read more about it here) that, as someone who played the third Tekken first, that going back to Tekken 1 and Tekken 2 was a major downgrade. I completely stand by that point obviously, but what I didn't actually mention was that despite that, I actually did see Tekken 2 before Tekken 3. 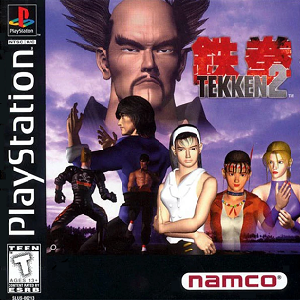 Before I got a PS1 I did see a friend play Tekken 2. I can't even remember what friend it was and when, all I remember is that it was at someone's house who I didn't visit often, in fact, I may have been passing in seeing them - a friend of a friend so to speak. But I vividly remember seeing Devil and thinking holy cow, this fighter looks amazing. 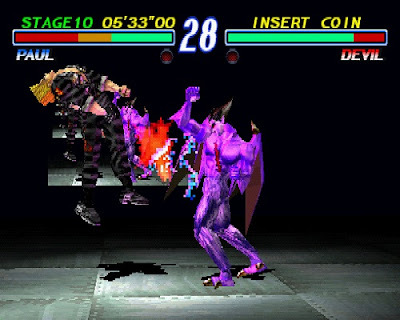 I didn't even know the game as Tekken 2, only that it was a fighting game with a purple Devil in it that looked so damn cool. Then, I played Tekken 3, fell in love with it and played Tekken 2 a few years later and thought the game had dated quite badly in that time. As I stated in the Tekken 1 entry, this game, simply pales in comparison to Tekken 3 in every way. It's not even that big a jump from Tekken 1, as a fighting game anyway. The visuals looked better and the new characters were a huge improvement, but beyond that the fighting game still lacked fluidity and good movesets that were to come with Tekken 3. It was certainly a work in progress, in my opinion. But, I think people who played Tekken 2 properly first will certainly disagree with me - I know a good few people think that Tekken 2 is the best one, and if you're one of those people then I'd imagine you're frustrated that it's so low on this list, so I'm sorry if so! What came in at #36? Find out here!